Maybe you’ve seen it online. Maybe you’ve seen it in your Strava feed… Your friends training on a remote island somewhere in the Pacific. You’ve seen new records and new challenges. And you can’t help noticing that your friends are biking a lot more than they used to this time of year. Well if you don’t know by now, that “thing” that’s gotten into all your friends is known as Zwift. The Zwift platform has effectively revolutionized indoor cycling and running, turning your basement workout area into a gateway for a virtual world of cycling and running. Read on to learn how you can make the most of this platform to boost your fitness this winter and beyond. We all know the progression — You’ve done your fair share of indoor training, using programs, machines and even classes in an attempt to stay focused and engaged throughout the winter. Raise your hand if you’ve watched every broadcast of Ironman® World Championships and Tour de France over and over again, you feel like you were there?! And then in 2017 along came Zwift. Maybe you’re a bit reticent at first because it involves some technology configuration but once we got all settled in, we realized something….. We didn’t stop pedaling. We saw a transformation from not wanting to ever ride longer than 60 minutes indoors to doing 2 1/2 hours on a very first ride! Yes, it’s that good. 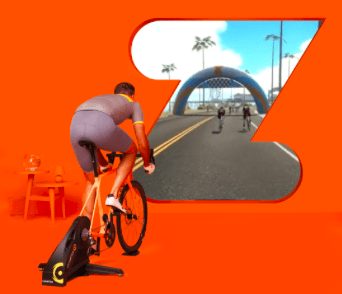 Zwift places you in a virtual world where your output on your bicycle, is measured through a power meter or similar device, causing your avatar in the virtual world to move. The harder you work, the faster your avatar goes. Simple enough! The difference is how social Zwift is. 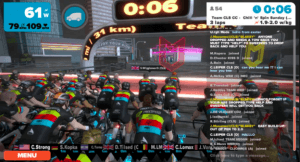 At the same time, you are riding, there are thousands of other people (around the globe) also training and racing in the same virtual space. As a result, there’s always somebody riding in Zwift even if it’s snowing outside where you live…or midnight…or a holiday. While Zwift can’t promise that you’ll get fitter, they can promise that you’ll never ride alone again. The game is very interactive. You can customize your avatar and earn experience points through riding to gain new equipment and unlock new jerseys. You can partake in challenges to gain other rewards. Here’s a list of Kit Unlock Codes if that’s your thing. Power User Tip: We recommend that you set your settings to measure in metric as you’ll get more points over time then you would if it was in miles. The net result is an engaging experience on an individual and group level. It’s very easy to see someone else riding your speed and to jump on their wheel. That’s right, if you are on a road bike in Zwift you can easily draft off of others and it does make a difference! Power User Tip: We recommend that you check out the Zwift Insider: www.zwiftinsider.com. 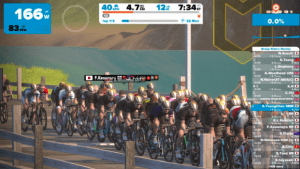 While It isn’t directly affiliated with Zwift, you will find tons of great resources including Videos, Maps and How-To posts Which will all help you to get engaged and make the most of your experience. While training in a virtual world is cool, simply riding more isn’t enough. Just like how you’d train during your race season, we want you to work smarter, not just harder. That’s right, you can easily do a test workout in Zwift. You can do it as an event that you register for using your Mobile Device, or you can upload a workout to follow versus just riding. Zwift does have a workout mode that allows you to upload files and challenges you to meet the targets that are based on your current Threshold Power. These fitness numbers will become both a carrot and a stick. There’s something for you to use when training so you know that you’re at the right intensity. You can use these numbers as something to try and exceed if you’re really challenging yourself. Power User Tip: Zwift does require an up-to-date weight to make sure that your avatar is working as much as you normally would on the open road. Be sure to keep yourself updated at least once a week so that the work you do inside the game will effectively translate to riding outside. Once you’ve tested and entered your weight, the next step is to pick the type of training session that you’re going to do. These are non-competitive races although they may have some intensity involved. They are non-structured group workouts, but you can still get challenged by working in efforts on a few climbs. Group rides are great to complement the work that you’ll be doing in a race perhaps, before the warm-up or after is extending time. The larger the group the faster the ride, and typically the more social it can become. You can use either interact inside the game messaging on your keyboard or connect with others using the mobile app called Discord that allows for live conversation. If you’re not sure which one to try, ask around or do yourself a favor and go look up the event results in ZwiftPower.com under the history tab and see whether or not you are close. Finally, what you been waiting for! We put this at the end because the other rides are far more engaging and can honestly be more effective. There are two types of workouts — ones you build on your own, or a group workout that you register for as an event. Actual workouts can be uploaded to the Zwift platform. These can be your workouts –which you can build on your own — or you can participate in as a group training session. Inside Endurance Nation, we create our workouts and give to our athletes as downloads. 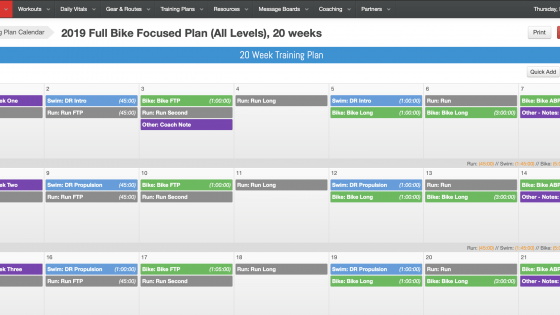 So when people are going to the training plan they can choose to either supplement the scheduled plan with a Race, a Group Ride or do the workout itself. You can also register for an event on the event module. Just read the description to see what the focus will be. Once you are in the workout, you’ll be in “no-drop” mode…this means, unless you really ease off, you’ll stay in the group. The workout will have prompts to follow on screen (based off of your Threshold Power). Note that unlike a race, faster riding won’t help you pass others in a group ride — it’s meant to be a collective experience. Depending on the type of training session you are scheduled to do, sometimes it does make sense to use a workout version instead of a race. 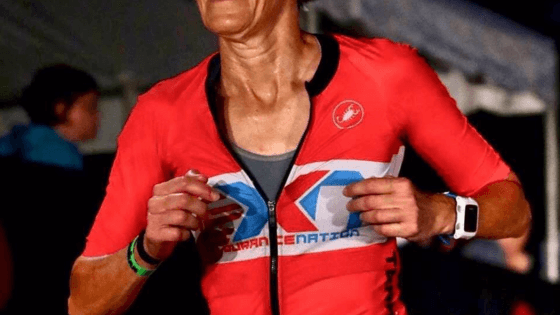 For example, when working on VO2 power, a workout will typically give you a far better session than a race that will have intermedia breaks and other challenges inside of it. There are a lot of good reasons why you will want to have something like Zwift in your back pocket. Primarily because inclement weather doesn’t just last in the winter their plenty of times during the season when getting outside is not safe or fun. Not to mention the scheduling nightmare riding outside can bring. You can grab your effective, powerful, safe workout in before work, at lunch, late at night and save hours of prep time. This leaves more time for family, work or our favorite… sleep! See, smarter, not harder. When starting out with Zwift itself, it’s important to start with your training plan / your current training focus. Then you can work backward to figure out how it can be a resource to help you achieve your goals. Endurance Nation athletes follow our OutSeason® Training Plans, which focus on bike and run threshold fitness development. This is not only effective because it’s so different than your In-Season training, but because you have enough time to recover between key workouts As your overall training volume is low. With our workouts already written for the Zwift platform, our members have the choice to either race or do a scheduled workout. We recommend that athletes race at least once (for threshold training), do a VO2 workout, and then meet up with the Team for a quality weekend ride. It’s at this time that you begin to move outside your normal training zone and start to venture outside the house. Traditionally, you’d be moving from indoor training to outer training – we see quite a large jump between the two in terms of training time. Thanks to Zwift, this could be an easier shift that you imagine. You can continue with your races as you see fit, especially if those weekday cycling windows are limited. 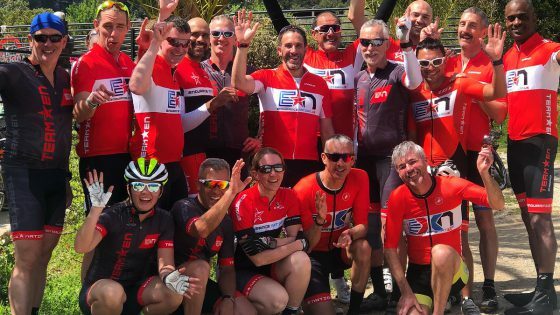 We recommend you use a group ride for the social aspect, as this will help you increase your mileage with a lower mental cost than if you were riding solo. Finally, there should be a medium-length solo ride where you can spend time in the aero bars and start challenging yourself. Regardless of where you fall on the spectrum, Spring training is an important bridge between the work done in winter and the work that you will do leading into your race. Recycling goals will be determined by the proximity and type of your next race, it’s fair to say this is a good rhythm you can implement. This is the most important part of the season. Not from a fitness-building perspective, however. During this time you’ll be doing a fair amount of training designed specifically to prepare you for the race itself. There should be key workouts, including race simulations, that will challenge you to meet your nutritional and pacing goals. 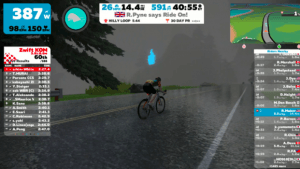 Zwift is a great tool at this time of year to make the hard workouts still effective (think extra motivation) as well as a great alternative if you can’t get outside due to weather or timing constraints. Inside Endurance Nation, our Long Ride and our Tempo Ride are typically on back-to-back days to provide challenging conditions and stimulate the appropriate muscular development we need to get more fit and oh-so-much-more faster. There are a lot several different ways to connect to Zwift to ride and run. If you are totally new to the game, you’ll want to visit this Zwift Support Page to make sure you have all of the pieces of the puzzle dialed in. Here’s the gear that Coach Patrick uses to make sure his set-up is rock solid. Wahoo Kickr – This direct drive trainer (no rear wheel, you just put your chain on to the unit’s cassette) has eliminated all the typical problems with trainers. No more wheel slippage Or flat tired. Better power transfer. Feedback from the game (hills make pedaling harder!) and so much more. Quarq RotoR Cranks – Run Zwift through your power-meter such that the power-meter controls the trainer resistance. No more power-meter calibration or spin down, and much more accurate watts. 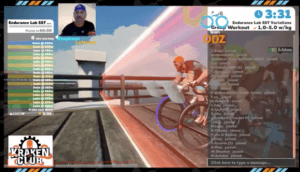 Stryd power-meter – Remember, you CAN run on Zwift!!! Simply activate your Stryd and pair with the computer. Then, start running (lag could mean it takes up to 30 seconds to connect and display your avatar as running). Hills don’t have an effect on your in-game experience; in most cases, runners stay at the same average pace despite inclines and descents. By far, the best part about Zwift is connecting with other riders. You don’t have to have people over to your house, but there is a myriad of ways to form a bond around your passion for cycling. If you click on someone’s name in the right sidebar (or their name in the mobile app) you’ll be able to give that person a “thumbs up” in the game. Riders accumulate these across the course of the ride in their jersey pocket…some folks end up with so many it looks like they are carrying a ton of virtual gels or food! This is the best way to just say “nice work” or encourage a fellow rider. 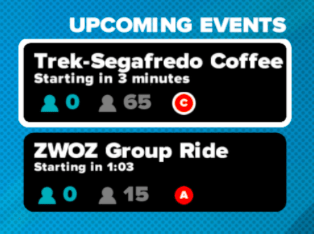 The game tracks these and will give you a chance to connect with these users on the exit screen before you save your ride and close Zwift. Another option is text messaging other athletes. Messages in the system can be displayed to all riders or to the group/race you are participating in. This is a great way to make jokes or to organize a breakaway/chase group. You can use the Mobile App to send a group message (in white, seen above) or to direct message (in orange dialogue box) a specific user. If you are using a laptop, you can press the “M” key to activate the dialog box and text everyone. Power User Tip: Users have the option to disable all messages in the preferences section. While this feature isn’t integrated into Zwift (yet?) there are third-party options to connect and chat with others. Best reserved for groups organized in the real world, these chat channels are a fun place for banter and jokes that pass the time. Some teams use their channels on race day for strategy and coordination. The current most popular app for Voice is Discord. You install it on your phone, Create a profile and than either/join a group (you’ll need an invite code) or create your own. We recommend you use hard-wired headphones for the best connection, and make sure the microphone is hitting your face…or beard…or is right next to your military-grade wind turbine. There are two talking modes — Voice Activated and Push-To-Talk. If you use Voice Activated, you can simply talk while you ride, hands-free. But you need to make sure you are set up correctly. 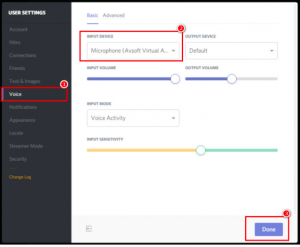 Once inside Discord, you can adjust your microphone sensitivity with a slider, making sure to keep all the ambient noise to the left of the slider (in orange) so that when you do speak it only picks up your voice. If you can’t make that happen, or if you are in a large group, Push-To-Talk is a great alternative. Users have to push the blue “Talk” button in order to speak. It creates a bit of a lag in the conversation, but if it keeps your channel free of noise it’s probably worth it! 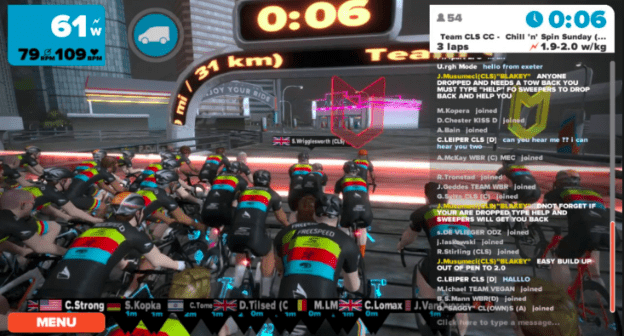 Some Teams on Zwift have taken being social to the next level with Live Streaming. With a multi-camera set up, they can record the entire training session — or race. The image ^above^ is from Team ODZ’s Wednesday Morning “Coffee with Hot Espresso” ride….approximately 45 minutes of steady riding followed by 15 minutes of hard effort. Some events will broadcast live racing as well, which is a great way to learn tactics and cheer on your friends. Most of the actual live feeds can be found by searching Twitch. How to Watch Your Friends / Teammates – Cheer Time! Do you have someone riding or racing that you want to check out? Simply log into the game and skip the part where you pair your devices. When you get to the screen to choose your loop, find your friend’s name and choose a ride…then click the orange ride button. Your avatar will drop in the game next to them, and you’ll have a few seconds to quickly click on your friends’ name in the right sidebar (or click on other names around them). This will put your camera view on them and follow them even though your avatar is sitting patiently on the side of the road. You can now give your teammate a thumbs up and virtually cheer them on as they crush their ride! Enter the Everest challenge immediately so you start earning points towards the Tron Bike (50,000 meters climbed). Don’t wait to start racing. It’s fun and challenging and you’ll wonder how you ever lived without it! Hardwire internet into your laptop or Smart TV to make sure the connection is bulletproof. If you use ANT+ to connect to your laptop, get the extender cable so the receiver is next to your device/ bike/trainer. Get an adapter so you can charge your phone and plug in headphones at the same time. If you have a power meter, pair it with the power source so you do not need to do a spindown. Using a smart trainer? Turn down the “trainer realism” setting to be about 10%. You shouldn’t have to shift ten times when you climb a hill! Don’t underestimate the fluids & food needed. Real riding requires real fuel! Using Discord? We recommend running it on your smartphone with wired headphones. Drain the pool of sweat that collects in the front wheel block if you have one. 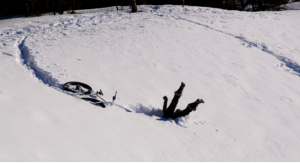 Remember to keep maintaining the bike (chain, pump the front tire to avoid continue pressure on the front wheel). Use your Power Up(s) before going through a banner as the next one could be more points. Don’t go off the front of a group ride. Don’t use a TT bike unless doing a time trial race. Keep your weight and height accurate. Register for zwiftpower.com – Where you can track your race results, etc. Note most races require Heart Rate data to confirm you are human! Read the article on fastest bikes to see what bike set up you want to get inside the game. Sign up for your event ahead of time using the Mobile App. This way you’ll be prompted to join the Event when you are riding (vs trying to find it). Start riding 10 to 15 minutes prior to your event so you can make sure everything is all set for the event. Pick a flat/easy course to warm up on and try to earn a power-up before you enter the event by hitting a banner. (Note: Not all events allow power-ups). The earlier you enter the “starting pen” the better your overall placing will be at the start of the event. Pay attention to the group…the bigger it is the easier they are going…the more of a line it is, the harder they are going at the front. Don’t lose that wheel…it will be all but impossible to regain a group unless you are with someone else. If you do get dropped, ride your best steady effort until you can find another group to work with. You can message them to get them motivated! Try to save a Power Up for the final sprint so you can take on the competition. The Aero Helmet is the best one for sprinting. The more you race, the better you get at racing! Download Zwift Mobile App and connect with as many of your friends as possible. This way you’ll see them when you ride, etc. When wanting to ride with a friend, find them at login. When you click on their name you automatically are doing the same course as them. Use ZwiftGPS.com to see where your friends are On the course at any given time. Power Ups are collected when you hit a banner/arch in-game. You use your space bar to activate them (or your Mobile App). You should be all set to jump in and experience the benefits of Zwift. We would love to have you give Endurance Nation a try – who knows, we might be your newest group of virtual buddies just waiting to help you get strong, fit and fast! Enjoy a free 30-day trial and ask us any questions you have about your endurance journey – from marathons, triathlons, hiking, ultras, cycle-cross…. You name it…. We want to tackle it with you! Until then…. May the Zwift Power be with you! P.S. 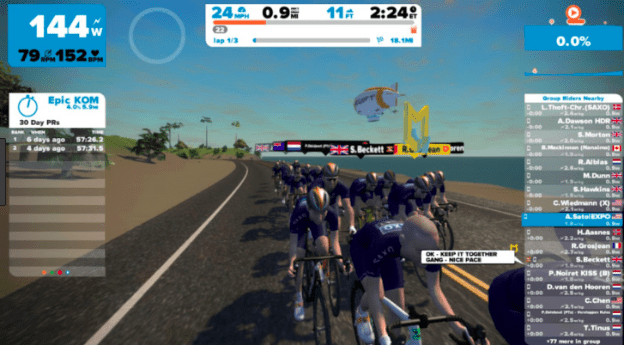 We will be giving away downloads to some of our zwift workouts in an upcoming newsletter…. don’t miss it – sign up!